Ideal for safe standing during repair or assembly work in front of machines and control cabinets. Platform W x D: 520 x 305mm. 240mm deep ribbed plate treads. Our lightweight aluminium platforms are what you require if you or your employees carry out a lot of work at medium heights, such as repairing, unloading or loading. They are available in four different platform heights, you can choose from; 200, 400, 600 or 800mm. 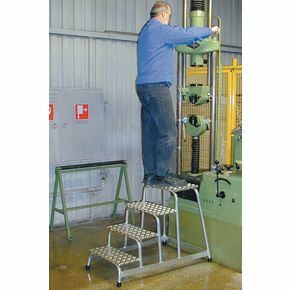 Slip-resistant plastic feet and 240mm deep ribbed plate treads allow you to work safely on varying levels. Their welded tubular aluminium construction reinforces their structure enabling them to hold up to a maximum weight of 150kg, you can be confident they are strong. The platforms width and depth are 520 x 305mm, giving the user a good surface area to work on comfortably. As they are made from lightweight aluminium they are easy to move, giving you an adaptable product that allows you to work in different areas at different heights. Our products are fully compliant with European standards and are available for FREE Next Day Delivery.